Yesterday Public Radio International’s (PRI) The World aired a broadcast on the Italian espresso: Espresso | PRI’s The World. While every news outlet in America was regurgitating Starbucks‘ publicity over their token three-hour store closure for employee training, reporter David Leveille took a different approach by interviewing the art of the espresso from a distinctly Italian perspective. Occasionally this Web site can be the source of a real life story, and the story of Caffè Mokabar is a good one. For a little background, after a couple weeks of espresso research in Piemonte, Italy last October, we were most duly impressed with Caffè Mokabar among all the coffee roasters we encountered. So when I wanted an authentic regional import to serve with a Piemontese meal my wife was planning for the private supper club she operates in the city, I scoured the Internet for Caffè Mokabar…but to no avail. Back then (unlike now) they didn’t even have a public Web site. So I settled on a U.S. distributor of Caffè Costadoro that I found. Andrea then introduced me over e-mail to his childhood friend from the ‘hood, Roberto Cauda, who was swinging by SF as part of his travels to a Las Vegas technical conference and could bring me a stash of Caffè Mokabar — which is unavailable in the U.S. However, there was one catch. Roberto was born an avid Torino F.C. fan, a granata, the cross-city rivals who would love nothing more than to see Juventus burnt to the ground in flames if not for the fact that both clubs have shared Torino’s Stadio Olimpico (i.e., 2006 Olympic Stadium) for the past couple of seasons (and for many, many years prior to 1990). For a little context, a lifelong friendship with an inherent football (soccer) rivalry like that is not far off from the Montagues and Capulets of nearby Shakespearean Verona fame. It’s ten times worse than the 49ers vs. Raiders fan rivalry. And just before our October travels to Piemonte, Juventus played Torino at the Stadio Olimpico for the first leg of the season’s Derby della Mole — which was spectacularly won by Juventus with a last-minute thriller of a goal by David Trezeguet that had me jumping on my sofa at home (but also ruing that I didn’t schedule my trip for a week earlier so I could attend the match). In all seriousness, Roberto was great company and I showed him around town for the evening. Being on neutral turf in America, perhaps it’s a bit like the truce between Israelis and Palestinians at Camp David. After all, I have good friends in Italy who are granata (“some of by best friends are…”). Though Roby shot me an e-mail upon returning to Malpensa afterwards: “P.S. you need a decent jacket :-)”. Given my home use of Caffè Mokabar’s best arabica-only blend, did it compare favorably with my experiences in Piemonte? One rule of thumb we’ve long held is that virtually any locally roasted coffee can be superior to even the best imports — given the freshness difference. Illy is a perfect example of quality that is outstanding in Europe but yet doesn’t translate as well in the U.S. — once shipped for many days and thousands of miles to SF as an oxidizing roast. This no matter how much inert gas or other freshness measures the roasters might take. Andrea was quick to acknowledge Illy as a great quality product for anyone to aspire to. And he was quick to mention how it was worthy of its considerable expense — just as Mark Prince mentioned in comments here how Ernesto Illy would have wanted it that way. But price even aside, I’d take this stuff over Illy beans in a heartbeat every time. The coffee holds up to a finer grind well. I tightened up my Mazzer Mini on it without the grinds “gumming up” together in the portafilter. Part of that is certainly due to the more modest roast depth of the blend. And as far as the flavor of the blend goes, that’s completely subjective — many people simply cannot stand the flavor of Lavazza, for example, regardless of freshness. But there are a few blends that really “wow” me in flavor even after the freshness fades, and this is one of them. Caffè Mokabar needs a distributor in the U.S. — so if we don’t pick that job up ourselves, you’ll at least have us as customers. Because unfortunately we’re all out! A big thanks to Roberto, Andrea, and the Bertolino family for underwriting this post with great coffee carried thousands of miles to reach us. I’ll be thinking of them when the next Derby della Mole takes place this Tuesday. Japanese consumer fads notoriously have about the same lifespan as mayflies — or a Rudi Giulliani presidential campaign, whichever comes shorter. However, here’s one we had not heard of before until seeing this in today’s The Daily Yomiuri: Newly harvested coffee beans attracting attentions : Arts Weekend : Features : DAILY YOMIURI ONLINE (The Daily Yomiuri). Japanese coffee consumption habits are vastly different from Western ones. It’s not just street coffee in a can or the rare siphon bar either. Instant coffee is still rampant, and decaf doesn’t even exist here. For those with higher standards, they do have fashionable, pricey coffee bars called kissaten that ceremoniously select and grind fine beans for you … and then boil the living crap out of it. However, some of Japan’s coffee elites have the habit of buying up small packages of boutique beans from around the world, and this latest consumer trend suggests a growing preference for the “freshness” of early harvest beans. Coffee cherries (and the beans they contain) are an annual crop — though there are exceptions of some growing regions having both a main crop and a fly crop (a smaller, interim crop between the prime harvests). The harvesting period for coffee depends on the region, climate, and, well, labor, and it can vary between three to six months (or year-round, as in the odd case of aged Indonesian coffees). While it’s not as critical as the freshness of roasted beans, green coffee bean freshness is important. But we haven’t heard much about the qualities of early harvest beans being that much fresher tasting than late harvest, as long as shipping supports lots as they are harvested. But, hey — at least it’s not shark fin soup or whale bacon. This just in from Italy: Putting EU Money to Good Use: Italian Scientists Unveil Coffee-Making Robot – International – SPIEGEL ONLINE – News. “A coffee-making robot?,” you ask? More than the specialized Swiss jobs we’ve talked about, we’re actually talking 1940’s Popular Mechanics/The Jetsons‘ Rosie … that kind of robot. The kind we’ve been promised for generations but only got lousy iPods instead. OK, so it can only make instant coffee. (What kind of Italians are these people, anyway?!) Meaning: call Howard Schultz and call off next week’s barista retraining! We’ve got a solution for his Starbucks troubles. Unlike the closer-to-home CCA (California Culinary Academy) — which has made overtures to become the “Draw Tippy the Turtle” of cooking schools by reportedly whoring itself out to every Food TV watcher/wannabe chef with a checking account — the CIA is held in the highest esteem among America’s top culinary pros. We still feel that many notable chefs suffer a kind of hubris: that demonstrating a mastery in cuisine naturally confers an equivalent expertise with anything put into your mouth (i.e., coffee — let’s keep it clean here, folks!). The fact that the CIA is giving it serious treatment is a real step forward given how far coffee quality standards at restaurants have to improve. It’s a rather snarky press release, but we confess to being amused by it: Coffee Klatch Roasting Celebrates Starbucks Store Closures With Free Coffee for Everyone. These days, Howard Schultz’s return to the CEO post at Starbucks has resembled nothing short of a panicked man caught on a runaway bulldozer, pulling every lever and knob he can find to steer the thing before it careens off a cliff. Last week, Starbucks announced that they were going to temporarily close some 7,100 cafés nationwide for three hours — to retrain some 135,000 in-store employees and people who oversee the stores. Hitting a company when it’s down smacks of a little schadenfreude, no matter how big the company. Starbucks did popularize better coffee in this country more than anyone else, even if today they are a lot like Mikhael Gorbachev‘s relevance to Russian governance after perestroika. But if Howard Schultz were to take our advice for improving the espresso standards at Starbucks, and if he were truly serious about his commitment to quality, we would only close about 6,900 of those 7,100 cafés — but never reopen them. Not to be outdone, Seattle’s Caffé Vita (one of the famous ‘V’s of great Seattle espresso) is offering a similar promotion, according to a blog on today’s Seattle Post-Intelligencer: Feb. 26: First No Coffee, Now Free Coffee. One successful press release can sometimes lead to another: Coffee Klatch Roasting Anti-Starbucks Promotion Sparks Nationwide Free Indie Coffee Uprising. Brisbane, Australia’s Courier-Mail ran an article today reviewing espresso drinks at various cafés in Brisbane’s James Street Markets: Fertile ground for battle of baristas | The Courier-Mail. They rated the flat whites at five cafés on a 10-point scale. For those unfamiliar with the flat white, it isn’t just Oceania’s lingo for a (caffè) “latte” — the way the British say “biscuit” to the American “cookie”. The flat white is mostly steamed milk, but it has a higher ratio of coffee than a typical caffè latte (but much less than a cappuccino). And unlike either an American caffè latte or cappuccino, it has a minimal layer of milk foam — even less so than the Italian cappuccino or caffè latte. Aussies and Kiwis love the stuff, and they frequently lament the lack of good examples of the drink away from the Southern Cross. (They also seem to have an odd preoccupation with latte art, but that may just be our observation.) The flat white is generally too much milk for our general tastes (it’s more milk than coffee, after all), but it’s definitely a step up from America’s preoccupation with the gargantuan cappuccino. Curiously enough, that Aussies and Kiwis have cultures deeply rooted in quality espresso, and no brewed coffee history to speak of, was once a source of (legitimate) pride. Now these cultural histories are something of an impediment for appreciating some of the outstanding, single estate coffees that have been coming out in recent years. As much as we love our espresso, it’s just not the best way to experience many of the subtle floral and fruity notes (coffee is a fruit, after all) that these coffees express under different brewing methods. Sure enough, brewed coffee is making its way Down Under. From today’s The Age: Brewing a big hit – Epicure – Entertainment – theage.com.au. Apparently there are now two Clover brewer machines in service in all of Australia — the machine having been discovered by an Aussie while in the U.S.
“Mystery” solved. As one of our readers commented on a previous post, Starbucks recently purchased two $11,000 Clover brewers for who knows what unholy purposes. However, today Bloomberg reported that Starbucks is testing them in at least one of their Seattle retail stores: Bloomberg.com: Exclusive – Starbucks Tests $2.50 Premium Coffee to Boost Sales. Between this and recent news of their new “dollar days” promotion, you really do have to wonder if their recent corporate shake-up included replacing their executive VP of corporate strategy with a Magic 8-ball. But whereas the $1 bottomless cup of coffee strategy seems aligned with Starbucks’ continued downmarket spiral, the $2.50 Clover-brewed coffee experiment is quite an anomaly. Unclear on the Concept: Starbucks Beans…in a Clover?! There’s been a lot of media coverage and squawk over coffee brewing technology these days. But a big reason why we’re even talking about brewing technology is because the coffee itself is making it relevant. We can use siphon bars and Clovers and notice the difference in our cups because of vast improvements in bean sourcing (Cup of Excellence coffees, etc.) and a more rigorous commitment to quality roasting and to keeping the inventory of the roasted beans as fresh as possible. Without the advancements made in the bean, the roast, and its freshness, the whole exercise of these high-end brewing machines is rather pointless. Thus it’s not clear that Starbucks even comprehends any of this. Starbucks still sources their beans from mammoth-sized suppliers (to ensure consistency and an appropriate volume to supply their over 15,000 cafés) and uses roasts that they do not dare date stamp. Even Starbucks’ “Black Apron Exclusives” beans aren’t held to the standards that most Clover-using cafés have. This makes Starbucks’ use of the Clover a bit like playing AM talk radio through a $30,000 sound system. What’s the point? After a decade of relentless focus on growth at all costs, Starbucks is clearly experimenting with quality and other long-ignored factors in the hopes of finding something that sticks with consumers — to revive their flagging brand. We still haven’t ruled out the possibility of Starbucks re-launching some of their cafés as “Starbucks Select” (think “Target Greatland”, etc.) 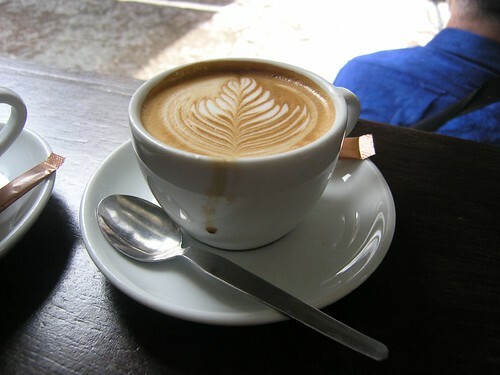 to allow them to focus more on quality at some of their cafés and help buoy the impression of quality at the rest. Well it took nearly seven years since we predicted it here. Starbucks has come out not with “Starbucks Select” but “Starbucks Reserve”: Starbucks, Facing a Saturated Market, Looks to the High End – NYTimes.com. What will those wacky Swiss think up next? Apparently, it’s an espresso-tasting machine: A machine with a taste-for espresso. The machine operates by analyzing gases released by a heat­ed es­pres­so sam­ple. By evaluating some of the over 1,500 aromatic and flavor compounds in a brewed espresso, the developers hope to replace a lot of the human profiling that still goes on in coffee production. A study on the effectiveness of the device, which is rumored to be nearly as ac­cu­rate as a pan­el of trained hu­man es­pres­so tasters, is planned for publication in the March issue of An­a­lyt­i­cal Chem­is­try. The coffee industry still relies heavily on human senses for evaluating what makes a good cup. While some day a Swiss-made, espresso-tasting robot may put CoffeeRatings.com out of business, I was also struck by something James Freeman told me yesterday at his new Blue Bottle Cafe. He took a moment to sample his siphon bar coffee after serving it — noting how he was impressed with how the bartenders at his neighborhood Nopa often sample their cocktails from the ends of stirring straws as a way to keep tabs on the resulting product. Technology can go a long way towards modeling the physical world. But until coffee is served by robots for robots, chances are that some things just can’t be replaced without the human touch. More news of this story is starting to hit the presses. This includes the Royal Society of Chemistry, which uses espresso-tasting profile charts as illustrated by the Centro Studi e Formazione Assaggiatori: Machines get a taste for espresso. There’s also the actual ACS publication: When Machine Tastes Coffee: Instrumental Approach To Predict the Sensory Profile of Espresso Coffee, where other blogs have excerpted some of its illustrations. Plus a weak, one-minute audio spot from Scientific American: Scientific American: Coffee Tasting Machine Stirs Industry.